I am cleaning out my stuff and I have an huge envelope of diecuts and stickers that I don't use and probably never will use. Instead of throwing them away I want to give my wonderful cyber friends a chance to win them. 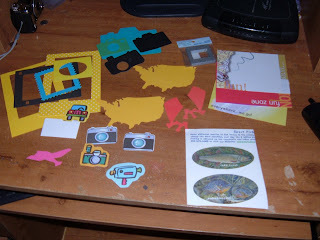 The diecuts are far from fancy I have had some of them since I started scrapbooking. They are all in usable quality (they are not bent or damaged). To enter all you have to do is a post about where your family will be vacationing this summer or if your not vacationing this year, where is your favorite place to vacation. I will pick a winner Sunday night (May 4) at 8:00 Eastern Time. In ALL messages please put your name and email address so I can contact you. Thank you for viewing my blog and good luck!!! I am happy to say that my headaches that I have been having 24/7 are finally going away. The dr. finally put me on blood pressure medicine (low dose) and what wonders it has made already and it's only been several days since I started taking the medicine. Instead of wanting to hide in the dark I now want to be in my craft room playing. I made this card for a co-workers birthday that is coming up in May. I have never actually meet her in person but when I worked in the Customer Service Department I talked to her several times a day. Now that I moved to another department within I don't get to talk to her but occasionly I hear from her through an email. On this card I got carried away with the pop dots, once I started pop dotting I couldn't stop (balloons,fringe on party hat, and present). Being the image came from a swap and I only have one of the image I traced part of it so I could pop dot it. I was going to pop dot the saying on the front but thought that was a little to much. LOL! I love the SplitCoast Stampers Page Map (SCS173), I love it so much I decided to make another card with this same sketch. This time the image I used I received from an image swap on SplitCoast Stampers. I believe this image is from Whipper Snapper, they have the cutest images but I don't own any (yet). 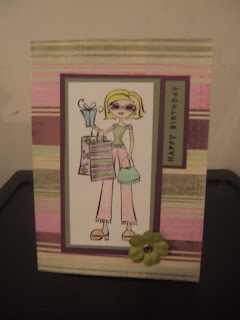 I may turn this card into a birthday card for a girl, not sure yet. Image from a swap colored in with colored pencils. Thank you for looking. Have a fabulous week! It's Sunday Scrappin once again. The days and weeks have been flying by lately. If you haven't checked out Sunday Scrappin I suggest you do, you will be glad you did. It's a wonderful group of crafters who share their TA Da's (Completed Goals) and their TA Do's (weeks goals). The great thing is there is no pressure if you don't complete the goals, and everyone in the group is very supportive. Bonus Question Do you buy patterned paper just because you like it, or because you have something specific in mind? I am so bad with this, I tend to buy paper for no reason other then one day I'm sure I'll have a need for it or it's just so pretty. Another down fall of mine is if they have patterned paper on clearance I must have 4 sheets of each because I don't want to go to do a layout and think oh that paper I saw at X would be perfect to find out they no longer carry it. I'm sure when Jeff (my husband) sees this post he will have a comment for sure. I am always making other people whether it's my parents, sister, friends, etc a card or scrapbook page I decided to make Jeff a card Just because. It was a quick card, didn't take me long but it's cute. Last night I put it on his pillow so when he went to go to bed it was there and when he saw the envelope he know it had to be something homemade and his face lite up, I was happy. The card is actually the SCS Card Map 173 (SC173). I have another card idea that I'm going to play around with later using this same card map possibly, so check back for that. Last weekend my sister babysat our dog Buddy while we went to Connecticut for the weekend. She was an awesome dog sitter and we would leave our dog with her again if needed. 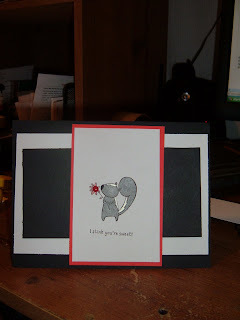 This is the card I made for her. 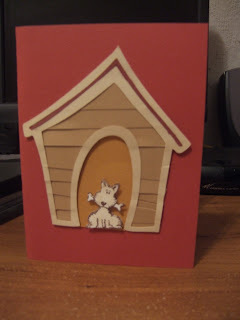 The dog house is from Cricut Paper Pups Cartridge. I layered tan cardstock strips under the dog house to give it a wood look. The dog is a stamp that I stamped on cardstock and then pop dotted. UPDATE On my Sister: She fell off her bicycle last night but she did not break her arm she severely bruised her wrist and hand. She is in a lot of pain. I took loads of pictures while in CT this past weekend. I made my BIL & SIL a copy of all the pictures. 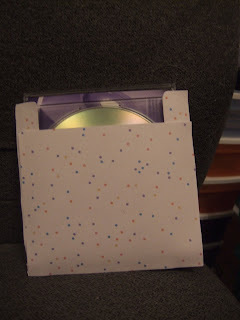 I wanted to make a neat little holder to for the CD. It came out okay, I did it in a rush last night I wanted to get it in the mail today (which I'm proud to say I did get it in the mail today). Click here for the template, I had to enlarge it a little on my scanner to get the CD to fit just right. The pattern paper I believe I got at the dollar store awhile back in a pack. The stickers I don't recall where they came from neither. SIDE NOTE: I forgot to give my sister her Thank you card for watching the dog so I mailed it to her today (she likes getting mail). So be on the lookout and I will post that card in the next few days. Speaking of my sister please say a pray for her she is at the Urgent care right now she fell off her bicycle and they think she broke her hand/arm. Can tell it's the start of summer when the kids start getting banged up. As always thank you for checking out my blog. I appreciate all of your support. This weekend also be on the lookout for some blog candy. It's Sunday so that means it's time to post my week's Ta Da's and week's To Do's. As I have told you before week after week Sunday scrappin is a wonderful group, you need to check it out if you haven't already. This past week I didn't think I would get anything done craft wise because I was working overtime every day and then we went to CT for the weekend. We had a wonderful time in CT, our niece and nephew are to adorable, we will be taking many more trips to visit them. I am glad everyone is talking again and getting along, it's wonderful. Back on track - here are my Ta Da's for the week (I'm impressed I got these done). Where is your favorite place to get craft supplies? I really don't have a favorite craft store. I usually go to either Joann's, Michaels, or Joann's if they are having a sale then I love to go there especially if its a good sale. 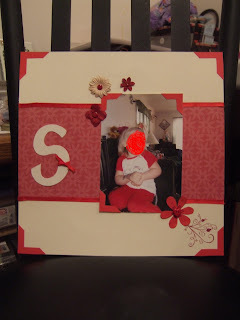 Last night I made one more scrapbook page of my cute little niece. I'm waiting to hear from my brother in law because I need to have a little chat with him. Don't get me wrong the outfit she wore was cute and all but I'm not a red type of person and I don't have many red scrapbooking items or colors that I could use that would look well. I will tell them next time before dressing her call and make sure it works with my scrapbooking stuff I have on hand. The page layout came from Valerie's Sketches (click for page map) I love her blog. For the S I don't have any chipboard that would work with this (sad I only have one type of chipboard letters and they are to pretty to alter) so I cut the S on my cricut machine and then I used the negative part as a pattern and traced it onto cardboard because I wanted a little weight to it so I could tie the ribbon around because the cardstock was thin and the ribbon would have crushed it. This will probably (notice I said probably) be my last post for the week. Have a great weekend and chat with you when I return from my mini vacation that I so need after this crazy week! It's my favorite part of the week (well besides Friday at 4:30 when I get off from work). It's Sunday Scrappin time where you have a great opportunity meet other talented crafters and you post your Ta Da's (goals completed in the previous week) and your Ta Do's (goals you want to complete this week). It's a great group and there is no pressure. Check it out, you'll be glad you did. First I want to say I'm a little upset on my Ta Do's for last week I mentioned I wanted to do a scrapbook page. I ordered the ink from Dell so that I could print out my pictures the ink came and then I misplaced it. I finally went to sit down the other night and do a page I had everything out and I couldn't find the ink. Jeff helped me look no where could it be found. Guess what we found today.....yup the ink. This week will be a quiet week because I have to work overtime all week and then at the end of the week we are going to CT for our niece and nephews birhtday party. What's your least favorite project that you've done lately, and why? 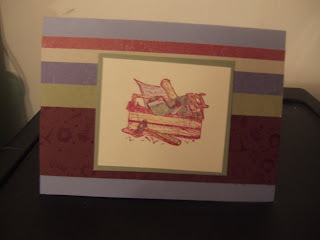 My most recent project that I made and I am not liking is this card http://chrissyscreativespot.blogspot.com/2008/04/tool-box-for-father.html it could be the colors but I'm just not pleased with it at all. I redid the card in different colors and style and it is much better. Last night I made a thank you card for my sister who be dog sitting next week. I can't post that one until I give it to her. So be patient (please) and I will post her card next Sunday. 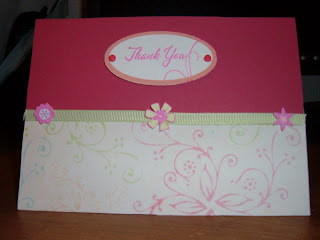 The thank you card that I made for my BIL and SIL I can share. Next weekend we are going to CT for a weekend trip for our niece and nephew's birthday party. We have not talked to my BIL in over 7 years. We will be spending the night at their house and the next day the SIL and I will be hitting the scrapbooking stores before returning home. Also my BIL rented us a car for the weekend. So I wanted to give them a Thank you card. My SU Upline recently had a pacemaker put in so I wanted to send her a get well card to help lift her spirits. 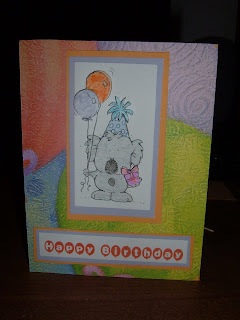 What a challenge I have the last several weeks between boy birthday cards, male birthday card and now a get well card. Those are the 3 areas oh and sympathy cards that I'm not the best at. Over all I am pleased with my get well card. My sister (age 12) is getting into scrapbooking and cardmaking finally after years of trying. 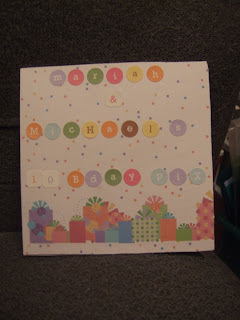 She has a scrapbooking poll up on her blog. Please go check her blog out and vote <---- click to go to her blog (you don't need to sign up or login to anything to vote). I greatly appreciate your support with this. It's Sunday Scrappin time once again! I love this group! It's a start of a new week and new craft goals. Sunday Scrappin is a wonderful group because on Sunday (or Monday if you didn't get to it Sunday LOL) you post your Ta's Da's (goals you accomplished in the past week) and you list your Ta Do's (goals for this week) and it helps to keep you focused and on track but if something comes up during the week and you didn't keep your goals there is no pressure and you don't get banned from the group. LOL! Be sure to check out Sunday Scrappin its a wonderful group. This weeks Bonus question: What kind of projects do you do the most often? It's that time of year where birthday's are popping up everywhere. 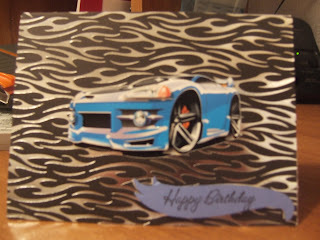 I must say I do a lot of birthday cards and scrapbook pages. Then second to that would be scrapbooking our dog Buddy. Here are my final attempts at making a boy birthday card. 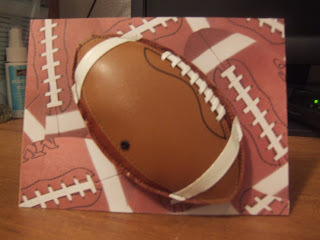 I am going to give our nephew the football card. 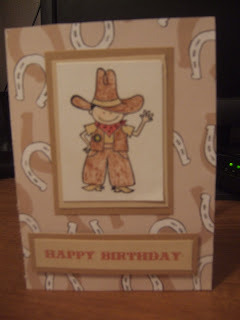 The cowboy card is cute but a little childish, he's going to be dad and the truck one is okay but not really kiddish. 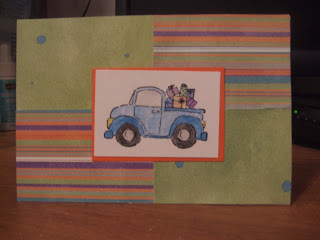 The Car one is a hotwheels 3d sticker that I got at Michael's for $1.00 and the paper didn't photo well its Harley Davidson paper. The football is actually a Jolee sticker. Phew I'm glad this task is finally over. LOL! 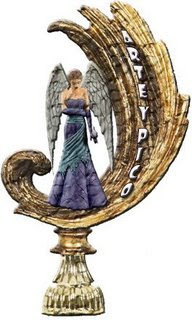 It has been a crazy hetic week, work was stressful and then I come home this evening to a wonderful surprise in my inbox, Annie gave me the Arte y pico award. I started this blog in December and I can't believe in such a short period of time all of the wonderful friends and support I have received through this blog. I want to thank everyone for their support. Big Thank you goes out to Annie again thank you for making my day actually my weeekend. It is the month's of birthdays. 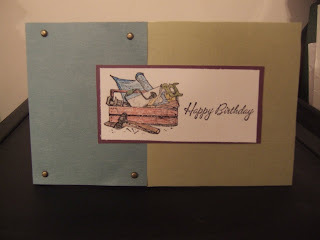 I have 3 birthdays to make cards for this month. It's that time of year where the birthdays come one after another. Here is a birthday card that I made for a 10 year old girl (no Kay this isn't for you your not going to be 10 LOL). It was hard because I don't know the girl. 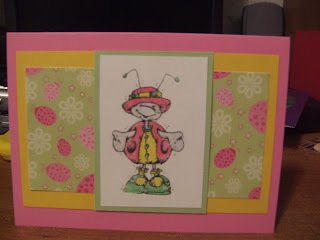 My BIL said she is a girly girl so I thought this would be a perfect card for her and her favorite color is green. I was not pleased at all with the first card that I made. This is the type of stamp that is gorgeous has is and doesn't need all the pattern paper and bling. I kept thinking no way can I give that card to my father. So I have been doing nothing but thinking about this card...well okay I have been thinking of a card idea for a 10 year old boy also. 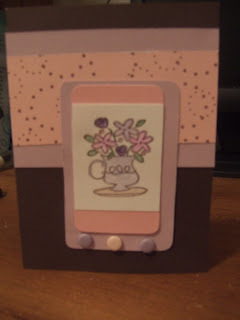 I am pleased with the way this card came out, this one is a keeper. I'm not sure if I'm really feeling this card or not. I'm not good at making male cards. I made it for my father who is celebrating his birthday the 20th of this month. Maybe over time it will grow on me.